What brings you joy? What’s most meaningful in your life? What defines your unique self? Each of us is different with our own choices, values, and perspectives across different facets of our lives. That’s what makes us a whole person. That’s why Homespire created the 7 Essential Elements of Wellbeing – as a framework for you to examine all the components that make you YOU and comprise your wellbeing. Our 7 Elements are used as a guidance system by our Life Care Managers to help examine the areas of your life that are working well, and reveal which parts need more support. 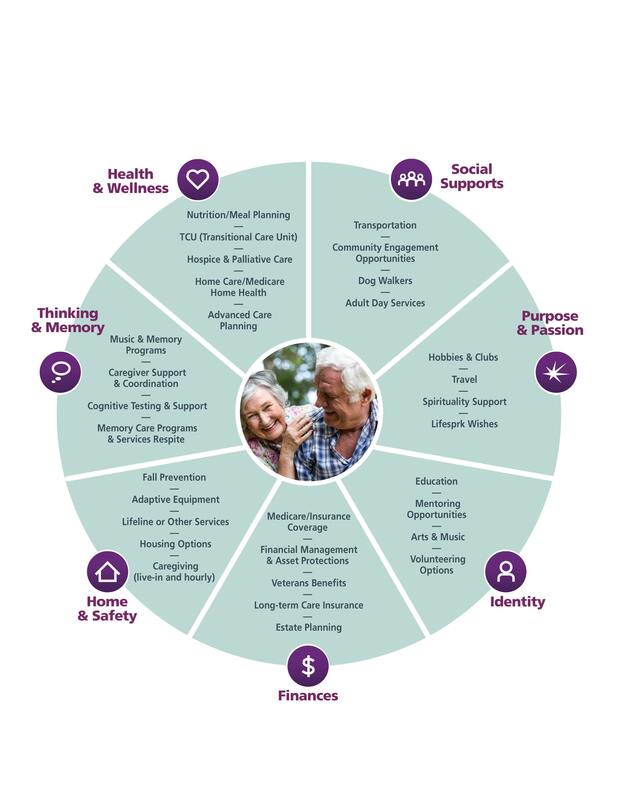 Your Homespire Life Care Manager will work to discover your personal 7 Essential Elements of Wellbeing to create your customized and individual Life Plan featuring your priorities and goals. Your personalized plan provides insights and opportunities for guidance to live a sparked life. And can be used by you and your family as well as the Homespire team and any other provider involved in supporting you. Having a pathway gives you more control, independence, and opportunity to bring together all that you enjoy to live your life to the fullest on your terms. You’ve been building social networks since you were born, Explore the opportunities for new and existing social connections. Working with your Like Care Manager, we identify your close family, friends, and introduce you to new people to broaden your social supports. Stay connected to the people and world around you by creating the best support and social life related to your goals. Want to attend church, go to the movies, enjoy a day shopping? Our team helps keep you connected throughout your community. Your identity is a critical part of your values and true self. Explore opportunities to reconnect with the past and embrace the future through sharing wisdom, heritage, and experience with those you love most. Identify life-enriching opportunities that bring out your purpose and passions in life. These are the reasons you continue to get up every morning and enjoy the day to the fullest. Whatever it is that sparks your life with passion, from volunteer work to gardening, to spending time with family, we can help bring it to life for you, so you live inspired each day. Health and wellbeing are fundamental qualities of life. We’ll review your health history, coordinate supportive services, and increase your ability to remain in control of the life you want to have. If there are any immediate health concerns, we identify those issues and work to get you back in tip-top shape, so your sparked life is one for the books. Home is where you find comfort, respite, and peace of mind. Your ability to meet your needs and desires within your home setting are essential. No matter where you call home, our goal is safeguarding against issues that jeopardize your independence, privacy, and safety. Having the ability to remember the time, places, people, and surroundings is a crucial aspect of who we are. Perhaps you worry about your memory or want to keep your brain and thinking as sharp as possible. We can help identify areas of concern and even provide baseline assessments as well as exercises and other resources to keep you as top functioning as possible. Financial planning, done carefully, reduces stress and sparks new opportunities all while providing peace of mind. We’ll assist in reviewing financial resources and connect you with those that will bring the highest quality of life and control for your finances.